Few things are more valuable for contractors than information, and that’s why we’re always looking to share valuable information with our readers. A while back we covered our 10 can’t miss podcasts for contractors, and today we’re going to cover 10 blogs that contractors should be checking out. There is a lot of valuable information to take away from each and every one of these blogs. This is the ideal blog for contractors looking for new ideas when designing an outdoor space. There are different tips and tricks here to help you create an amazing outdoor space focusing on decks and patios. This blog is informative and will give you the inspiration you need to start creating your next outdoor space. Electrical Easy is just as it sounds – it takes complex electrical topics and breaks them down into more simple terms for the everyday person to understand. A great resource for contractors who are experts or novices in the electrical field as it is informative and thoroughly explains each topic that is covered. While there aren’t many fencing blogs out there, this blog takes the time to post a few times a month covering different fencing topics. It is an informative blog that answers common questions people may have when it comes to fencing along with different creative approaches to fencing. Not only does this blog cover flooring tips and tricks, but it also gives inspiration ideas for your upcoming projects. It answers questions regarding flooring ranging from hardwood in the kitchen to tile in the bathroom. This will be your one-stop-shop to all things you need to know about flooring. This blog really focuses in on all of the different technologies that are available to help supplement HVAC in today’s world. If you don’t keep up with the latest in HVAC technology, this blog will be very informative as it breaks down the most popular and useful technologies to use. This blog is updated regularly with posts covering many different insulation topics and questions that your customers may have. It also goes over different tips and tricks for getting the most out of your home’s insulation during all months of the year. A well-maintained blog with up to date information about the latest trends in the landscaping industry. They cover a very wide variety of topics in an informative manner ranging from different materials they recommend using to design ideas for your next landscape. It can be difficult to keep up to date and relevant plumbing information on a blog, but 3 Mountains Plumbing does a great job regularly maintaining their blog posts. There are a variety of topics covered including everything from drain problems to sewer repair tips. This blog specifically focuses on different DIY projects but can be very valuable for contractors who do remodeling projects. There’s a lot of good inspiration here, and many ideas to help you work with customers to help them understand the line between contractor work and DIY. The All Roofing Solutions blog can be a valuable read for roofing contractors, as it keeps up on some of the latest trends in roofing. The blog also covers wa ide variety of common homeowner roofing questions to help you prepare for anything a potential customer might ask. 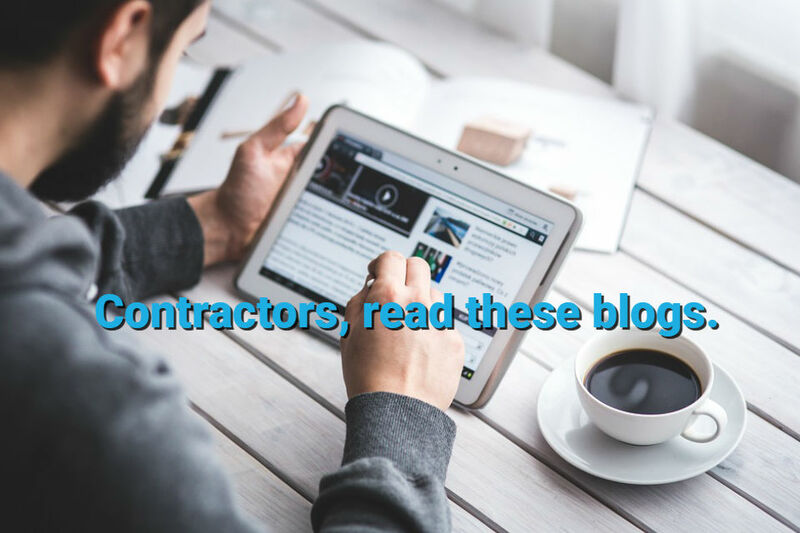 Did we miss any of your favorite contractor blogs? If so, please let us know! And while you’re here, be sure to check out our JobFLEX proposal app which will turn your proposal process into a piece of cake. The link below can get you started with a free trial.